Please refer to our stock # 3283 when inquiring. 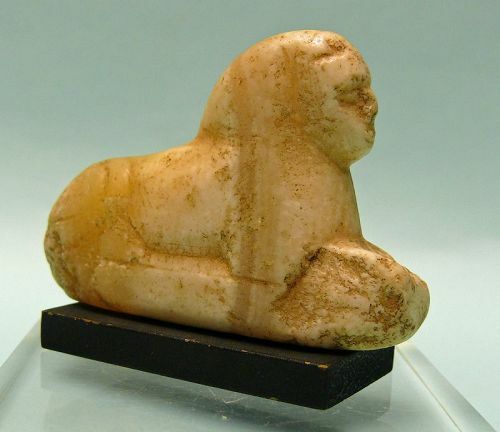 Ptolemaic Marble Miniature Sphinx (305 - 30 BCE) Intact and in excellent condition. Small drill hold on left haunch. 1 3/4" x 2 1/2" x 3/4". Collection number on bottom as seen in images. Ex: Christie's New York, sticker on base. Sculpture represents the pharaoh as a hybrid creature, a male lion with a human head. Its small size and details of its headdress suggest a date in the Ptolemaic period. The Ptolemaic period was a Hellenistic kingdom based in ancient Egypt. It was ruled by the Ptolemaic dynasty, which started with Ptolemy I Soter's accession after the death of Alexander the Great in 323 BC and which ended with the death of Cleopatra and the Roman conquest in 30 BCE.